• Shepherds Hook Is 90 Inch In Length and 1/2 Inch Solid Square Steel. • Has A 3 1/2 Inch Opening. • 1/2 Inch Solid Square Steel. • Hook That Is 70 Inch In Length With A Single Upturn Hook. • Comes In Black Powder Coat Finish. Used for burning wood charcoal and artificial logs.. Designer emboseed cast iron construction and high temperature paint finish. Full 360 degrees view of fire with a fine wire mesh spark screen. 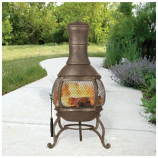 A large sliding door rain cap log grate and fire tool are included. . Heavy duty double crane that is 90 inches tall and has a 5/8 inch solid square steel knock down.. Black powder coat finish.. . . .
Steel construction with high temperature resistant finish. For burning wood and artificial logs. 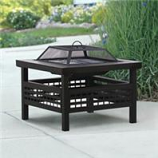 Log grate and fire tool included. Fine wire mesh lift off spark arrestor screen. . 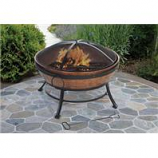 This extra large sized fire bowl with attractive copper finish is perfect for back yard entertaining.. With a 360 degree view of the fire everyone can gather round. Its sold base included leveling mounts providing ultimate stability.. Includes a spark screen for added safety. . Hang a beautiful plant or bird feeder with this adjustable deck hanger. 36 inch length anger and 3/8 inch stock. Clamp fits 2x4 or 2x6 in rails. . . The sturdy steel ring holds pots up to 8 inch in diameter.. 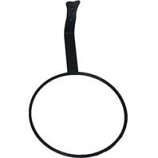 The black powder coated finish meshes with your home or backyard.. A flat metal arm and tab support this ring and attach to a wall or post easily with included screws.. Durable construction ensures the item lasts for several seasons for a versatile accessory. .
Shepherd hook has a single forged hook with a height of 48 inches.. Also has a 1/2 inch solid square steel and has a black powder coat finish.. . . . The 81 inch wrought iron crane is handmade wrought iron from vermont. It has a powder coated black finish for lasting protection. 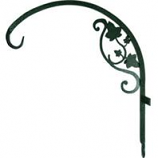 A wonderful decorative accent for hanging baskets birdfeeders or plants. . .
• Durable and Long Lasting Fence and Deck Hook. • Approximately 36 Inches In Length With 7/16 Inch Stock. • Simply Attach The Hook's Base With The Enclosed Screws and Make Sure It Is Secure Before Hanging Anything On It. • Heavy Duty Magnum Crane With An 18 Inch Double Hooks To Hold Large Hanging Baskets and Feeders. • Also Has A 5/8 Inch Solid Square Steel Knock Down and Is 90 Inch In Height. • Push Crane Into The Ground. 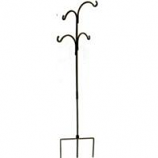 • 3 Arm Tree 36 Inch In Height 3 Piece Steel 1 1/2 Thick Wall Tubing. • Comes In A Black Powder Finish. • Tree Extension Hook Is 48 Inch In Length and 1/4 Inch Stock. • Has A 3 1/2 Inch and 7 1/2 Inch Opening. • Comes With A Black Powder Coat Finish. • Hanger Has A Heavy Duty Wall Mount and Is 22 Inch In Length, With 7/16 Inch Stock. 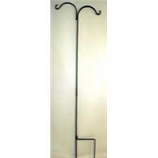 • Has A Downturned Hook and Comes With A Black Powder Coat Finish. • Upturn Straight Hanger Forged 15 Inch In Length and 3/8 Inch Stock. • Comes In Black Powder Coat Unless Otherwise Noted. Mouting Plate For Feeders and Houses. 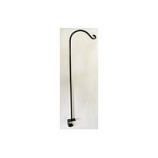 • 5 Ceiling Hook With Flared End and 1/4 Inch Stock. • Comes With Black Powder Coated Protective Finish. • Upturn Curved Hanger Forged 12 Inch In Length and 3/8 Inch Stock. • Approximately 36 Inches In Length With 3/8 Inch Stock. • Extension Hook Is 24 Inch In Length and 1/4 Inch Stock. • Upturn Curved Hanger Forged 9 Inch In Length and 5/16 Inch Stock. Heavy duty downturn curved with vine. . . . .
• Downturn Curved Hanger Forged 8 Inch In Length and 3/8 Inch Stock. • Extension Hook Is 8 Inch In Length and 1/4 Inch Stock. • Has A 1 Inch Opening and Comes With A Black Powder Coat Finish. 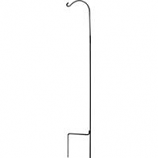 • Extra Tall 106 Inch In Height Shepherd Hook With 2 Hooks and Is 1/2 Inch Solid Square Steel. • Comes In A Black Powder Coat Finish. • Crane Is 60 Inch In Height and Has A 1/2 Inch Of Solid Round Steel With A Single Hook. 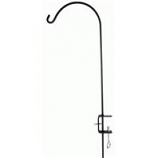 • Extension Hook Is 18 Inch In Length and 1/4 Inch Stock. • Hang A Beautiful Fern Or Other Plant, Or Perhaps A Bird Feeder With This Handy Adjustable Deck Hanger. • Clamps Fit 2X4 Or 2X6 Inch Rails Has A 36 Inch In Length Hanger and 3/8 Inch Stock. • Extension Hook Is 6 Inch In Length and 1/4 Inch Stock. Use to hang bird feeders plants wind chimes bug lights lanterns and any other hanging ornaments.. Comes with clamp for 2 x 4 or 2 x 6 inch flat rail.. Black powder coat finish.. 3/8 x 30.. .
Crane is 90 inches in height and with a 1/2 inch solid round steel with 2 hooks. Comes in a black powder coat finish. . . .
• Downturn Straight Hanger Forged 12 Inch In Length and 3/8 Inch Stock. • Upturn Straight Hanger Forged 6 Inch In Length and 5/16 Inch Stock. • Upturn Angled Hanger Forged 6 Inch In Length and 5/16 Inch Stock. • J Hook With Up Turned Flared End 3 Inch In Length and 1/4 Inch Stock. • Comes In Black Powder Finish Unless Otherwise Noted. 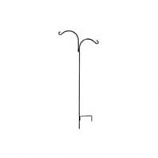 • Curved Hanger Is 24 Inch In Length and 1/2 Inch Stock. • Upturn Curved Hanger Forged 18 Inch In Length and 7/16 Inch Stock. Hang a beautiful fern or other plant or perhaps a bird feeder with this handy adjustable deck hanger.. Comes with clamp for on a 2x4 and 2x6 rail.. Has a upturn hook that is 36 inch in length and 3/8 inch stock.. Comes in a black powder coat finish.. .
Crane is 90 inches in height with a 5/8 inch solid square steel knock down. Has 4 heavy duty hooks. Comes in black powder coat finish. Push into the ground. .
Strong forged steel construction. Multi-use for year round seasonal and holiday decor. Add beauty to outdoor living spaces and entry. . .
• Extension Hook Is 4 Inch In Length and 1/4 Inch Stock. • Crane Is 84 Inch In Height and Has A 1/2 Inch Solid Round Steel With A Single Hook. 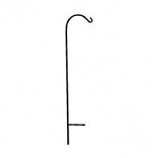 • Shepherd Hook Is 90 Inch In Height With A 1/2 Inch Solid Square Steel. • It Has A Hook and A Hummingbird Pattern and Green Vein. • Upturn Angled Hanger Forged 12 Inch In Length and 3/8 Inch Stock. • Shepherd Hook Adjust Between 60 To 90 Inches In Height and Has A Double Hook With A 7/16 Inch Solid Square Steel . 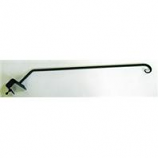 • Extension Hook That Is 30 Inch In Length and 1/4 Inch Stock. • It Has 2 Hooks and A Hummingbird Pattern and Green Vein.